This post was about as political as I ever got here in the Rabbit world. I learned my lesson. Not everyone can play nice with this particular topic. Just watch any cable news network. I've disabled comments on this one since I can't easily moderate crazy while in the audience of The Late Late Show with Craig Ferguson. It is the only reason I ever watch "Dirty Jobs" or want to buy a Ford truck. 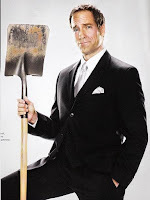 Mike Rowe. "...the airwaves are overrun by TV shows about people—er, men—with dangerous, physical, soot-collar jobs. If people want to come home from a hard day's work and watch other people put in a hard day's work, more power to them—these shows attract tons of viewers. What's annoying is how they suggest there's a fascinating character study happening beneath the surface. What makes someone do this for a living? They seem to ask. We've got a theory: money, and lots of it. Want to see a really dangerous job? How about a woman working for minimum wage at a big-box retail store who can't afford health insurance? Marvel as she scans groceries, aggravating the carpal tunnel for which she can't go to a doctor. It might not be as visually compelling a show, but it would certainly be more relevant." The presidential election is uber-important this year. I am not yet convinced as to which candidate better represents the issues that are most important to me. But I do know that a lack of affordable and adequate health care for citizens of this country is a serious problem. I write that as someone who didn't have it for 7 years and now does. (Of course, my insurance only has to cover check-ups right now. What if I developed an illness that it wouldn't cover?) I write that as a daughter of parents who pay almost $1000 a month in order to have basic coverage. I write that as a sensible human being who knows that people get sick and deserve help without needing to sell the kidney that the stone came out of.